Finding the perfect used Ssangyong couldn’t be easier with Carsnip - we’re pleased to offer you 781 used Ssangyong vehicles at great prices. 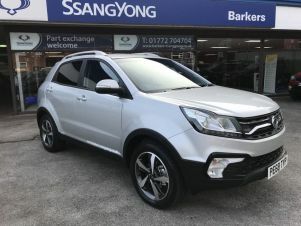 With such a large variety all in one place, we make it simple for you to find the ideal used Ssangyong car in your area. Ssangyong is a South Korean manufacturer which focuses mainly on low-cost SUVs. They’re not yet an established name, but are working to remedy that by catching up with rivals such as Hyundai. At the smaller end of the SUV range is the Tivoli, which easily rivals other compact SUVs for a much lower price. With plenty of space inside, it’s undeniably a practical and low-cost vehicle. The largest SUV Sssangyong offer is the Rexton. Although the quality might not be up to the likes of Land Rover, seven seats and four-wheel drive for a very low price is an attractive offering.